Just think how hot you feel in summer’s temperatures. This time, most dogs live in high risk of overheating and definitely, you are well informed about the dangerous effects of summer heat on pets. So, it is very important to find out a way that helps to keep the dog’s core body temperature down. This is exactly why you should consider a pool, even though veterinarians said best dog pools can easily relief your dog from overheating and keep them cool throughout the day during summer. Many experts warn pet owners about the risk of high temperature and the significance of using the dog swimming pool or a house with cold water to keep dogs comfortable. However, we have spent more than 72 hours of research; consult with a couple of renowned pet specialist and few famous pet pool manufacturers to review the top 10 choices to provide your dog a comfortable life in the summertime. Through this article, we also pointed out the necessity of swimming pool for dogs, what should you consider before choosing the best one and some other relevant topics to save your dog from overheating. Our first listing is a large and heavy-duty bone-shaped white play pool to bathe large dogs. This great pool made of very strong and durable truck bed liner material. It is not only UV resistant but also remains cool in the heat and don’t require keeping in the shade in the summertime. As a chew and scratch proof dog pool, it is able to save itself even from the largest paws. The proper dimension of this pool is 11″x44″x66″ can hold almost 85 gallons of liquid to the top and it is great for dogs of all sizes. The installation of a brass drain makes it easy to clean the pool. This one dog bone pool is enough large for any sized dog to lie down happily and it is shallow enough to easily step in. But you should not use this pool for multiple dogs at a time. 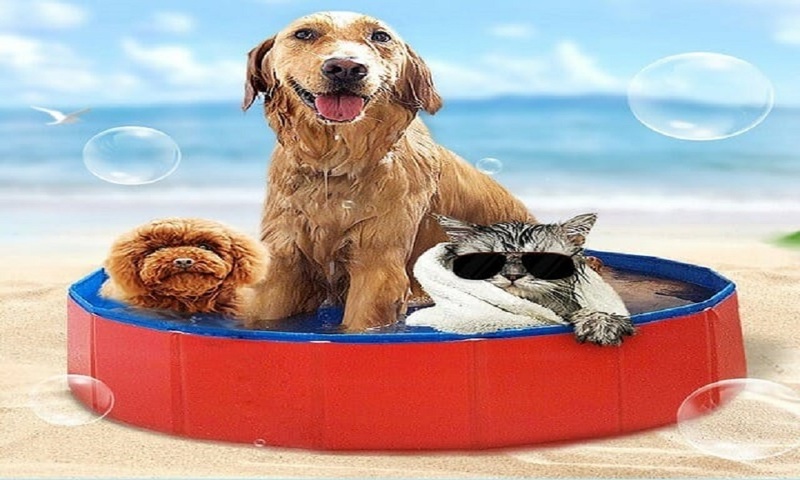 This doggie pool also comes with so many other features those are great to keep relax your dog at summer time. Its price is a little higher for the great quality and you need a flexible budget to purchase the bone pool. FrontPet Large Bathing Tub made from ultra-hard PVC material for long-term use. It is easy to manipulate, just fill with water before using and release the water by opening the sealed drain of the tub for safe storage. 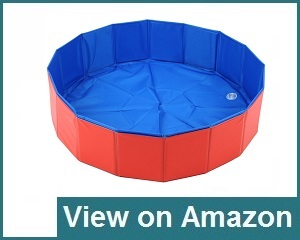 Front Pet Foldable Pet Pool has 50 inches large diameter with 12 inches depth. It allows even large dogs for standing, sitting and lying down in the pool to get totally soaked and cool off. You will be happy to know that, it won’t leak, tear or damaged while the pooch jumps or run in the water of the pool. This foldable pet pool is portable and easy to carry out for outdoor using. Just simply fold the pool and pack up after eliminating the water before transportation. You can also use this pool as a dog bathtub, baby bathtub, fish pond or outdoor water pond for your dog. After all, it is a perfect pet toy for your dog to enjoy the summer heat and also work as a mini pool or pet bathing tub. After using the pool when the water becomes dirty you should change the water empty out. One Dog One Bone is a blue bone-shaped made of durable and heavy-duty truck bed liner material. This chew resistant material has the special additive to makes it scratch protective and UV resistant. The pre-condition of an ideal pool is the capacity of how much water it can actually hold? To get the actual experience of swimming, you should be concerned about the depth of the pool and fill with water before using. This bone shpae holds up to 85 gallons of water and stays cool in the extremely hot summer time. It is made by one of the unique shapes like a dog bone and ensures higher quality than any other pools on the market. It is able to hold the largest dog breeds and ensure their free movement with relaxation. It is one of the sturdiest construction with quality materials and easily contains multiple dogs at the same time to let them play with each other. It is also perfect for dogs that love to chew very much. It can contain dogs up to 130 to 140 lbs and without any hesitation, you can keep it clean easily after your dog’s playtime. This Outdoor Swimming Pool is an ideal bathing tub for pets and we have listed it as the fourth quality swimming pool for your dog. It is made of rugged and heavy-duty materials with stylish and practical designs. It is a great option if your dog loves to travel at outdoor to enjoy beautiful sunny days. It offers easy bathing for your pooch. The dimension of the pool is large enough, 47-inch diameter and 12 inches deep. 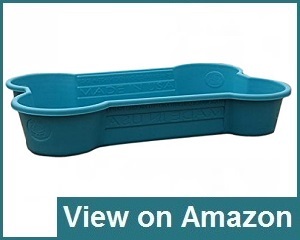 This portable swimming pool is easy to fold into a plastic carry case to bring for outdoor use. The heavy-duty durable PVC used material offers a safe set up for hours of enjoyment. It is very easy to set up, no need to inflate, just fill with water and let your pet to enjoy a hot sunny day. It is stress-free to draining the pool after using; just need to twist off cap drains the pool in no time. Blue Paw shaped Pool made of heavy duty and durable truck bed liner material. This quality dog swimming pool specially designed for smaller dog breeds can hold up to 20 Gallons of water to the top. To drain and clean the pet pool, you can easily flex it like a paw. The positive thing of this doggie pool is the structure. It is made of the really hard material which is scratch free, chew resistant and a special additive which makes them UV resistant. It is a white colored swimming pool absorb less light from the sun and keep the pool cooler. Manufacturers also assure that the water inside white pool remains 10 ºF cooler in summer. Between two available colors, most of the pet owner prefers the white color than black because it keeps the water cooler long time and it is easy to observe whether the pool is dirty. There is no drain to clean the pool but you can tip it very easily. 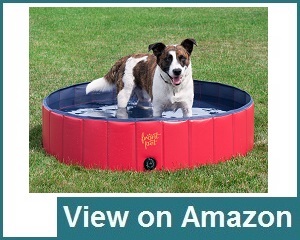 This dog wading pool is flexible for the small and medium-sized dog but very tight for the large canine. On the above, there is a list of five great swimming pools for dogs. These are very popular for their quality, functionality, and features. And here are another 5 alternative pools for large and small dogs to save them in the summertime. 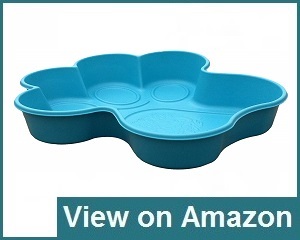 Cool Pup Splash provides your dog a great opportunity to stay cool down in summer days. 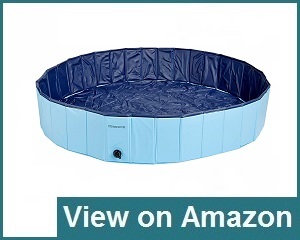 It is a unique collapsible pool made of super hard PVC for long-lasting use and it can hold 19.75 to 119.25 gallons of water to allow all pups. This splash dog wading pool is foldable and portable, that’s why pet proprietors can carry it anywhere with them for outdoor using. It is also easy to clean after every use just by releasing the water. There are three sizes are available of this model to fit for different dog breeds. 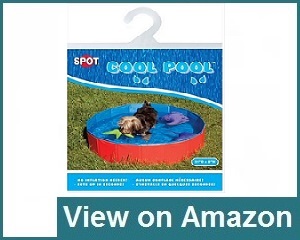 This Ethical Dog Cool Pool is perfect for dog bathing and enjoying summertime. It is made by 100% sturdy and durable PVC material allows for long time using. 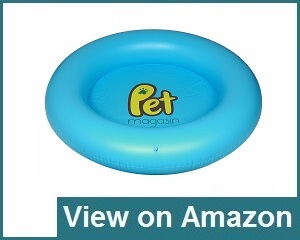 The actual measurement of this pool is 31 inches in diameter and 8 inches in depth which is perfect for small dogs. Without any inflation, you can simply set-up this kiddie pool within a few minutes and also can remove the water after using with the help of a convenient plug. Pyrus Collapsible Pet Pool comes with a wide range of applications. It can be used as dog bath or baby bath, fish pond or the outdoor pool. 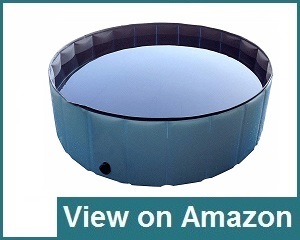 The main advantages of this pool are it is foldable, portable, and easy to transport anywhere. 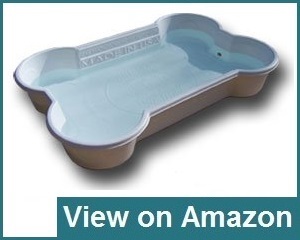 It is an affordable dog swimming pool with a decent and simplistic design made with all eco-friendly materials. 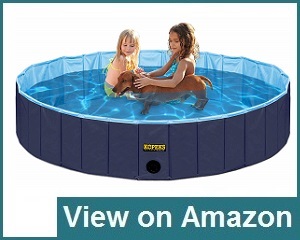 Your cute pups can take shower, swim and play more safely and feel comfortable in this pool. It comes with two large sizes; the large one is 47.3 inches in diameter and 11.8 inches in deep. The extra-large pool is 63 inches in diameter and 11.10 inches in deep. Lalawow Foldable Pet Swimming Pool made with safe and quality PVC cloth, never collapse even full of water. It is lightweight and foldable, easy to carry for using at outdoor. Good quality drainage makes it easy to release the water after using. The actual size of this small pool is 80 cm in diameter and 20 cm in deep for large size and 32 inches in diameter and 8 inches in deep for the small size. You can use this multi-functional pool as baby bathtub, fish pond, outdoor water pond or as a bathtub for your pet. It doesn’t absorb high temperature to keep the water cool and save your dog from summer. It is one of the most important criteria to identify the best pool for dogs. A pool should come with a durable material; sometimes a large dog may fall into serious danger for a fragile pool. There are some good materials need to include within it. Metal: Used metal should be rust-resistant and waterproof. PVC: Durable and heavy-duty PVC is sturdy but flexible and ideal for making it fold away. Polyurethane: The Durable polymer is great to make the pool chew resistant and scratch free. You should be well informed about the size of the pool to ensure your dog’s maximum comfort. If you want to lay your dog in the water to cool off, then you don’t need large space to splash around and play. On the other hand, if you want to allow your dog to swim in the pool, obviously you need a pool that is large enough. Small dogs can normally swim in the pools those are designed for large dogs. Some plastic pools are come in multiple sizes to allow more than one dog inside the pool. Now, it is your time to choose the suitable one according to your dog’s size. Many pet owners wish to discover an easy way to allow their dogs in the pool. So, before choosing a dog poll, just ensure there is no risk if your pet tries to move deep in the pool when you are not present around the pool to keep an eye on them. Large dogs can easily step over the side from the majority pools but for a small dog, it is needed to install steps to get them in or out easily. There are so many pools in the market designed in different shapes and sizes from a variety of materials. Here we have picked out a few of them based on their quality and features. These pools are solid, strongest and made with heavy-duty thick plastic. It’s a safe place, where your dog spends lots of time to get release in hot summer. Since they are too sturdy in design and construction, they can’t be folded or minimized for further use and very tough to carry for outdoor using and maintain. Inflatable pools are comparatively smaller in size, lightweight and most portable, so these are great for pet proprietors on the go. It is easy to fold up even very largest models facilitate to carry out and store for next using. Mainly, they are special for smaller dogs and indoor using for low space consumption facilities. There have also some drawbacks and you should always be sincere to use this pool. Due to soft walls it can be easily punctured or scratched by claws and the dog may be injured. So, ensure the strong plastic body with other materials for your dog’s overall safety. Folding pools are more reliable than other; they come with inward folding facilities to pack up easily. They are made from semi-rigid panels which make it stronger and allows to the last multiple of years without any trouble. Folding pools are easier to set up and it comes into complete shape when filled with water and gets pressure on its walls. Due to rigid panel construction, they are enough durable and aren’t as vulnerable to the dog’s claws. Many folding pools come with drains in the side walls to release the water easily and pack them when swimming time is over. Rigid pools are also known as kiddie pools that are most durable than other three options. These are made from very strong plastic materials to make them extremely strong. It’s a great choice for pet proprietors who have dogs with destructive behaviors and like to damage household elements in minutes. Your dog may apply extreme force through its claws on the pool’s walls but there is no chance to leak the pool. These rigid pools can’t be folded, that’s why it is not easy to carry for outdoor use and difficult to store in the room. Like other products, here you should also consider some special features which make the pool something different to fit your needs. So, after studying a couple of products, our experts shortlisted some features that ensure the highest quality pool within a reasonable price range. At first, you should analyze in which size your dog fits best. For a medium sized dog, you should not exceed 20 gallons limit to be risk-free. It will be also dangerous if you have children in the house. But for a large dog, the capacity of the pool needs to be more than 30 gallons. It would be a house of plenty of water to have fun for hour after hour. Large pools also have large holes to release the dirty water after using. It is another vital feature, and an ideal pool must be made of heavy-duty, strong and durable materials. Most of the time aggressive dogs hit the wall of the pool through their sharp claws and it can be damaged by low-quality construction. It should also become with chew proof and slippery free material to ensure long-lasting use. Thinking about the proper dimension of the pool is also vital because it’d be very bad to purchase a shape that doesn’t fit properly to your dog’s size. Try to choose a model with wide and deep space, so that your dog can completely sink on it and do more fun. Some dogs are not water friendly and you should pick a small pool to get them habituated. It is interesting to filling up the pool with water and you love to see your dog’s enjoyment deliberately. But, as a dog owner, you should pay attention to the quality of drainage facilities. Plastic pools are easy to pull out and look for to clean up the tough drains are located on the side or bottom of the pool. There are plenty of opportunities comes with the dog swimming pools during the hot summer season and few of them are described below. Helps to keep the dog cool: Swimming is a great way to keeps your dog cool around all year. It is especially needed for a dog has thick coat becomes overheated fast like a Bernese Mountain or Siberian husky. Offering your dog a place to become cool off will help them to keep happy and healthy. Help to ensure physical fitness: Large pools allow small and medium-sized breeds to swim around a bit. Swimming is a high-intensive activity help to keep your dog fit and trim. We know 5 minutes of swimming is better than 20 minutes of walking for a dog. Mental stimulation for aging dogs: In hot summer, your dog becomes habituated to swim in the pool regularly. Regular exercise keeps your dog’s brain active and alert by proper stimulation in their mind. You can engage them in playing by throwing a few toys in the water. It will help them to stay fit and trim. Help to become your dog more energetic: Regular swimming helps to build your dog’s body muscle with improved strength and stamina. A suitable pool brings a great advantage for dogs with disabilities like arthritis and they become completely grow up from this disease by getting exercise in a relaxing environment. Enhance canine-human bonding: It is another great advantage for pet proprietors. Dog owners never agree to let their pooch to swim in the pool alone. They always try to keep them in complete supervision while the pooch spends time in the pool. These enhance the close bonding between the canine and its owner. Always keep the pool clean after using. Check the water at least twice in a week and make sure it doesn’t grow up any harmful bacteria or parasites in the water. It would better to change the water if your pooch uses it every day. Question: Why should you need a dog swimming pool? Answer: Basically, pet owners collect swimming pools for their four-legged furry friend for two reasons. First one is it’s a place of doing the immense amount of fun and enjoyment to makes your dog happy and refreshing. A swimming pool is the best way to save your dog from hot summer, heatstroke, and overheating. These may cause death or serious injury for your dog’s health. Question: What are the main characteristics of a dog pool? Question: What is the basic difference between dog pools with other pools? Answer: Pools, that are specially designed for dogs are made by considering the dog’s characteristics to meet their demands. Most of the dogs try to play high activity level on the pool by their sharp claws and teeth. So, it should be made with more durable, sturdy and long-lasting material to face aggressive dogs. On the other hand, kiddie pools are small in size and not needed to be too much sturdy and strong like other pools. It should be kept a kid under constant supervision while using the pool. Question: Is there any special benefit of dog pool? Answer: Basically, these pools offer a cool place to get relax your dog on warm days and allows for having fun during the hour after hour. They feel happy to splash, play and retrieve toys in water all day long. Large dogs feel free in larger pools to burn some extra energy where small pools provide wonderfull canine-human bonding experience at outdoor gaming. Question: Is it safe for dogs to drink pool water? Answer: Actually, used water in the pool considered as wastewater and definitely it is harmful to drink. Your dog may be suffered from serious skin disease or destructive worms. The pooled water becomes polluted while the dog taking bath and surely it will not be safe to drink.